Timber was a real wolf and he did have a level of intelligence that would have challenged most men! He was a friend of the author and his son and daughter-in-law — a close member of the family in almost every sense. How he actually began his life we will never know — but he did first come into human contact when about six months of age he met the author. He had never seen a human before that first encounter, yet it was truly as though two humans were meeting and finding a magic spark of friendship between them right from the first moment! He was far more intelligent that even this story portrays! 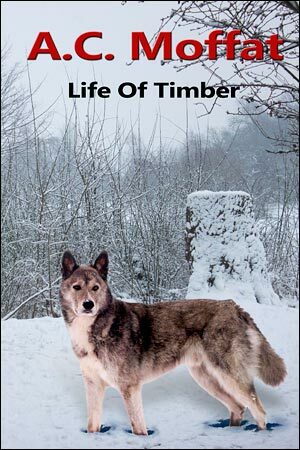 The real Timber lived out his life in a safe sanctuary, among humans and unfettered by chains or leads. He had acres of open land and woods in which to freely roam and play. He was well loved! His mind quickly went through all that had happened, organized it all, played out each act and fact against others and came to the clear and reasoned conclusion that this man was a friend and one he could trust. An amazing thing had taken place; and even more amazing when measured by the normal in the animal world! Now the wolf stood up and slowly advanced into the clearing before the den. His tail was wagging — his peace sign!